Best-selling author Bodie Thoene was born in Bakersfield, California, to a family of Irish and Jewish heritage. The fiery little redhead claimed from an early age that she wanted to be a writer, a dream that she has pursued with remarkable success. 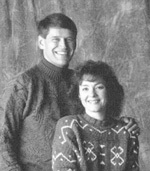 She is pictured here with her husband, Brock, who is also a novelist. Together they have written over 50 books and sold over 20 million copies worldwide.